When I was 14 my mother, a nurse and widow with five children, severely injured her back. As a result, she was confined to bed at home in traction for three months. I clearly remember taking the weights on and off the traction unit, helping her to get dressed and helping get in and out of the car. This is when my passion for helping people — especially those with pain — started. My own personal journey through injuries, surgeries, and life’s stressors, led me to gain a better understanding of bodywork fundamentals, including the importance of core strengthening and posture, in order to design new exercise programs to help myself. 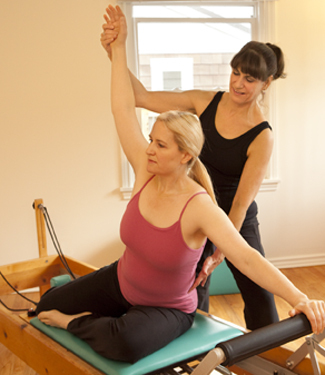 Using the principles and equipment from Pilates, and inspired by Bartenieff Fundamentals® and Feldenkrais®, I developed a unique program of conditioning techniques to address a variety of fitness issues. As we learn more about body mechanics and integration, I continue adapt my program and approach to conditioning. I have enjoyed years of teaching different genres of Pilates in many different settings from traditional studios, to physical therapy clinics, workshops and my private studio. I am grateful to have a career that is also my passion.